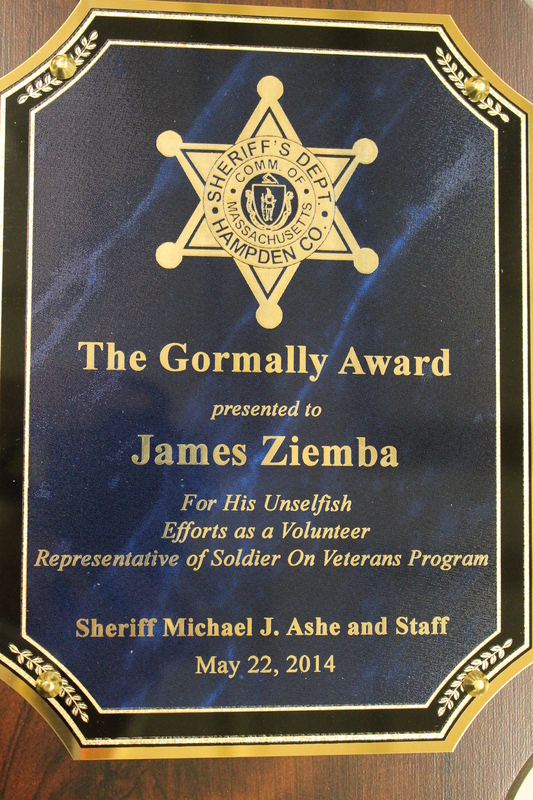 Soldier On employee James Ziemba was awarded the Volunteer of the Year Award from the Hampden County Sheriff’s Department. 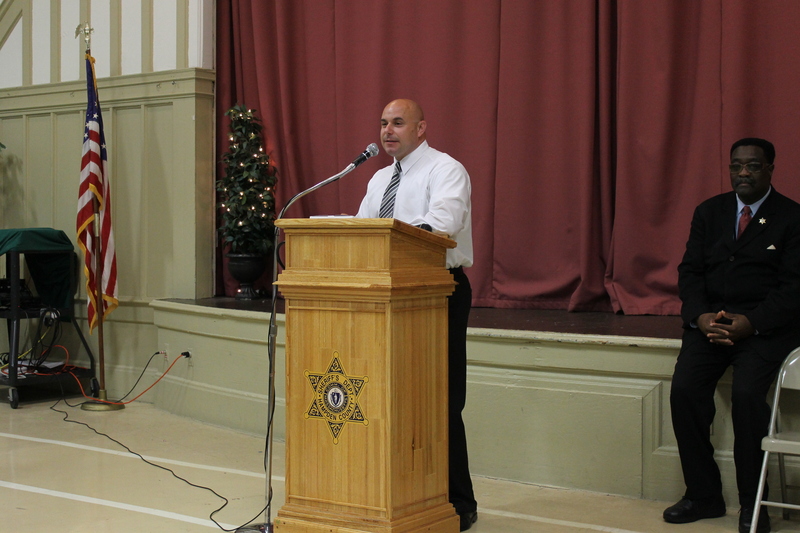 The award was presented to Jim last night, May 22, 2014, at the Twenty Seventh Annual Volunteer Appreciation Night. The appreciation dinner and presentation of the award took place at the Western Massachusetts Correctional Alcohol Center in Springfield. 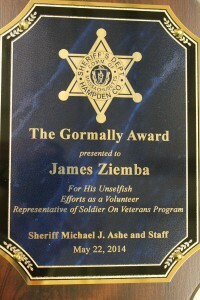 Jim was chosen as this year’s recipient of the Gormally Award for all of the work that he does throughout Hampden County and Western Massachusetts with veterans in need, particularly incarcerated veterans. 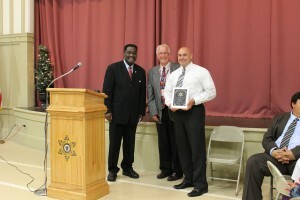 Assistant Deputy Sheriff James Gill and Deacon William Toller presented the award to Jim, thanking him for all of his hard work and dedication. Congratulations Jim! This award is a result of all of your hard work and is well-deserved! Soldier On has been working to assist veterans in New Jersey since 2012 with funding from the Department of Veterans Affairs’ Supportive Services for Veteran Families (SSVF) grants. Soldier On is active in nine counties throughout northern and central New Jersey: Middlesex, Burlington, Ocean, Hudson, Monmouth, Essex, Mercer, and Bergen. Through our outreach program, Soldier On provides case management, referral services, and temporary financial assistance to veterans and their family members who are homeless or at risk of becoming homeless. Soldier On works with other federal, state, and community programs to better serve the veterans that we work with. Hundreds of veterans in Middlesex County have benefitted from a specific alliance of which Soldier On is an integral part. The Middlesex County Board of Chosen Freeholders worked with the Middlesex County Office of Human Services’ Division of Housing, Community Development and Social Services, to institute the Veterans Housing Assistance Program (VHAP). Soldier On, along with community organization Community Hope, works closely with Middlesex County and VHAP to provide an array of services to veterans throughout the county. Every two weeks case conference calls are help during which veterans’ services staff, Soldier On staff, and Community Hope staff coordinate and work together in order to provide more comprehensive assistance for homeless and near-homeless veterans. These calls help the participating organizations to fill service gaps for those veterans who need assistance in a variety of ways, utilize each other’s resources in the most productive way, and avoid duplication of efforts. The Middlesex County Veterans Services Program, Soldier On, and Community Hope have been chosen as the sole recipients of the National Coalition on Homeless Veterans (NCHV) Partnership Award for the partnership that they have formed and model that they have created. The award was presented to the recipients May 29, 2014 at the NCHV conference in Washington DC. The Memorial Day Races held annually in The Berkshires, MA are excited to partner with Soldier On, a private nonprofit organization committed to ending veteran homelessness. Soldier On will be active throughout the weekend. In conjunction with the races they will be holding a silent auction, which will take place at the Memorial Day Races Pre-Race Expo on Saturday May 24, 2014 between 9:30 AM -5 PM at Tanglewood and the MDR Pre-Race Pasta Dinner held at Mazzeo’s in Pittsfield, MA. Among the items available for bidding are: lunch for four at the Red Lion Inn; Round of gold for four with carts from Cranwell; Complimentary two night retreat and renewal stay for two at Kripalu Center; and a copy of “Never Give Up” autographed by former New England Patriot Tedy Bruschi. All proceeds from the auction will benefit Soldier On. In addition, Soldier On volunteers will be on site all weekend assisting with water tables on the course. Soldier On provides safe affordable housing to homeless veterans, including permanent limited-equity ownership units at the Gordon Mansfield Veterans Community in Pittsfield, MA. The Mansfield Community serves as a national model as Soldier On actively seeks to extend its successful veterans’ programs to communities throughout the United States. For more information visit www.wesoldieron.org. The 5th Annual Memorial Day Marathon Races will take place on May 24-25, 2014, starting and finishing at Tanglewood in Lenox, MA. The races will feature the Memorial Day Marathon, known as “The Toughest Marathon in the East”, The MDM Half Marathon, The Tanglewood 10K/5K, The MDM 15K Trail Race, The MDM Kids Run, and the Memorial Day Dirt Ride. A portion of the proceeds will benefit Soldier On and Team Red White & Blue. Additional information can be found at http://www.memorialdayraces.com. BOSTON — The Community Economic Development Assistance Corporation has approved a total of $280,000 in financing to the non-profit Soldier On, Inc. for veteran housing in Northampton. With this funding, the organization will develop two supportive housing projects on the campus of the Veterans Affairs Medical Center in the Leeds section of Northampton to aid formerly homeless veterans, according to a press release from the corporation. The $140,000 Front Money Loan will go to developing the Gordon H. Mansfield Veterans Cooperative Housing project. The four-building permanent housing project will consisting of 44 one-bedroom units and provide supportive services to formerly homeless veterans in the area. Several local organizations will partner with Soldier On to provide many of these services, which will include case management, education and vocational training, substance abuse treatment, and life skills development. “For years, Soldier On has been a leader in providing permanent supportive housing and services to veterans in need,” said Roger Herzog, the corporation’s executive director. Also located on the VA Medical Center Campus, the Leeds Transitional Veterans Housing project received $140,000 in funding from the corporation. The facility will provide transitional housing to 16 formerly homeless individuals, many of which are expected to be single women or mothers with children. The project will include 16 bedrooms, four communal kitchens, and eight shared bathrooms. Of the 16 bedrooms, 12 will be handicap accessible and 3 will have sleeping lofts to accommodate mothers with children. Additional supportive services will be offered using an integrative treatment program for those battling post traumatic stress disorder, substance abuse, and trauma. 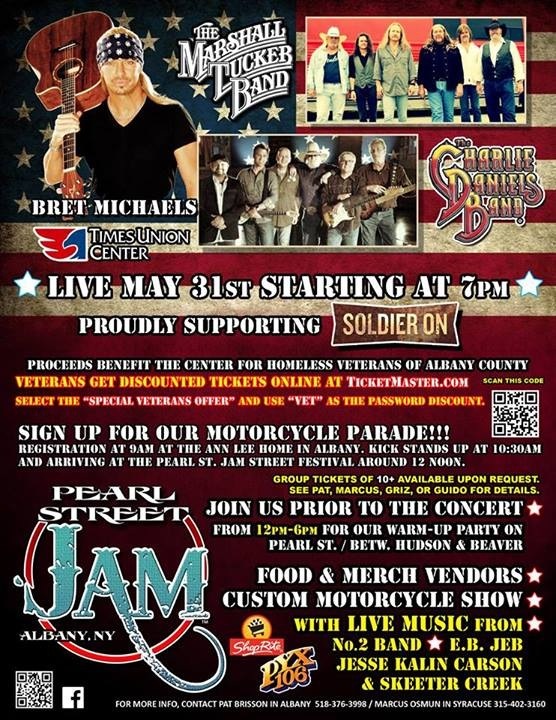 Who: Albany County and the Times Union Center are hosting a motorcycle parade, street party, and concert to benefit Soldier On. What: A press conference, featuring Jack Downing, Albany County Executive Daniel McCoy, and representatives from the Times Union Center and the event, will take place at the Ann Lee house in Albany at 10am. Registration for the motorcycle parade begins at 9am at the Ann Lee home and the ride kicks off after the press conference. From 12pm-6pm there will be a “warm up party” on Pearl Street in Albany. The concert, featuring The Charlie Daniels Band with Bret Michaels and The Marshall Tucker Band, will begin at the Times Union Center at 7pm. When: Saturday, May 31; 9am registration, 10am press conference, 12pm-6pm warm up party, 7pm concert. Where: Ann Lee home, Pearl Street, Times Union Center, Albany, NY. For more information regarding the days’ events visit www.pearlstreetjam.org. For tickets visit Ticketmaster or the Times Union Center website. Contact Maggie Porter with questions, mporter@wesoldieron.org or 413-441-5728.
Who: Soldier On is hosting a silent auction to benefit our veterans programs. Where: The auction will be set up on the Tanglewood grounds all day Saturday and will then move to Mazzeo’s for the pre-race dinner on Saturday night. On Sunday, May 25, we will be back at Tanglewood for the morning of the races. The winners will be announced early Sunday afternoon at Tanglewood before the Summersound concert begins. For more information regarding the races visit http://www.memorialdaymarathon.com/. On Saturday, May 24, and Sunday, May 25, Soldier On will host a silent auction to benefit the organization’s veterans programs. The auction will take place on the Tanglewood grounds all day Saturday and Sunday morning during the Memorial Day Marathon Races and on Saturday evening at the pre-race dinner at Mazzeo’s. The winners of the silent auction will be announced early Sunday afternoon before the Summersound concert kicks off at Tanglewood. Visit the Memorial Day Marathon website to register for the races. Contact Maggie Porter, mporter@wesoldieron.org or 413-441-5728, with any questions regarding the weekend’s events! On May 31, the Times Union Center in Albany is hosting a concert to benefit Soldier On and, specifically, their project for a homeless veterans center in Albany. The concert features The Marshall Tucker Band, The Charlie Daniels Band, and Bret Micheaels and will begin at 7pm. Soldier On president/CEO Jack Downing will be addressing the audience during intermission to explain what Soldier On does and the organization’s plan to expand housing to Albany. Tickets for the concert are available at Ticketmaster or on the Times Union Center website. Prior to the concert there will be a motorcycle parade. Registration is at 9am at the Ann Lee Home in Albany. Following the parade there will be a warm up party from 12pm-6pm on Pearl Street. The party will feature live music, food and vendors, and a custom motorcycle show! 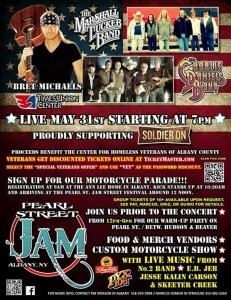 Visit www.pearlstreetjam.org for more details on the days’ events. Please contact Patrick Brisson with questions about the motorcycle parade and warm up party, pbrisson@nycap.rr.com or 518-376-3998. Contact Maggie Porter with other questions, mporter@wesoldieron.org or 413-441-5728. We hope to see you at the events! LENOX — The fifth annual Memorial Day Races, a two-day series starting and ending at Tanglewood, may attract 1,500 to 1,600 participants, according to organizer Matt Linick. “It brings in people whom we hope will come back and enjoy the town on their own, a younger audience than we usually get in the summer, which is very good for us,” he said. Last year’s races were attended by 1,400 participants, said Linick, 41, whose active-travel company, Running Away, is based in Boca Raton, Fla. The event on the weekend of May 24-25 will feature the Memorial Day Marathon and Half Marathon, the Tanglewood 10K and 5K runs, the Memorial Day 15K Trail Race, a Trail-Road Challenge and Kids Race. Most events are on Sunday, with the exception of the 15K Trail Race and Kids Race, both held on Saturday. So far, registrants are from Massachusetts — about 38 percent of the total — as well as the New York metro area and more than 25 other states and nations, including Florida, California, Canada, the Philippines and Brazil. Most registrants stay overnight at sites such as the Apple Tree Inn and Cornell Inn, both in Lenox, and the Red Lion Inn in Stockbridge. A post-race party is held at the Olde Heritage Tavern in Lenox while other eateries and merchants benefit from the crowds, including Guido’s Fresh Marketplace and Price Chopper, Linick said. New attractions this year include an early-morning, 55-mile Memorial Day Dirt Road Ride for mountain bikers on Sunday and a full-fledged, post-race SummerSound music festival at Tanglewood that afternoon. The concert, from noon to 6, features Northampton-based Heather Maloney, a singer-songwriter who performs folk, jazz and pop. Other bookings include the Boston-based Adam Ezra Group, an acoustic-rock band; The Interlopers, young Great Barrington musicians who now attend Berklee College of Music in Boston, and Skyfactor, a New York City band. Tickets are $15 for the general public; race participants are admitted at no charge. The concert, organized by SummerSound Live, a subsidiary company owned by Linick, is building a stage for the festival at the main gate parking lot at Tanglewood. The Tanglewood box office will open during the weekend for summer concert ticket sales. “If it’s remotely nice out, we expect a big crowd,” he said. The goal is to create a two-day festival, Linick explained. Until this year, the event was known as the Memorial Day Marathon, but he changed the name in order to reflect the wider scope of attractions. The new Dirt Road Ride is an informal, 51-mile trek through the Berkshires, limited to 300 riders. It will set out from Tanglewood at 7:45 a.m. May 25, proceed on Undermountain and Reservoir roads, and continue through portions of Richmond, West Stockbridge, Alford and a slice of nearby Columbia County, N.Y.
A pre-race Expo will be held on the Tanglewood parking lot grounds from 10 a.m. to 5 p.m. May 24. A portion of the weekend’s proceeds benefits Team Red White & Blue, a national advocacy group for veterans, and the Northampton branch of Soldier On, which assists homeless veterans at its Pittsfield facility on West Housatonic Street. Last year’s event raised about $30,000 for Team Red White & Blue, then the sole beneficiary. The festival’s major sponsors include Tanglewood, Greylock Federal Credit Union and the Arcadian Shop.